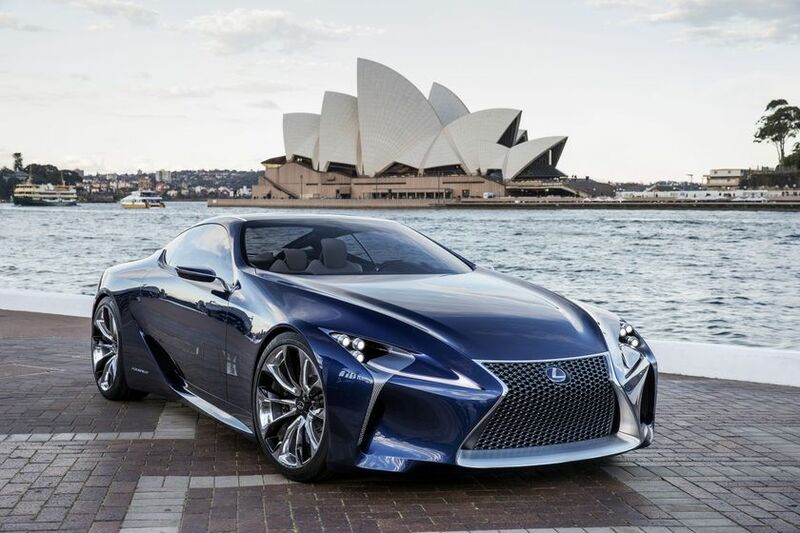 (Sydney, Australia) - Lexus has revealed the stunning LF-LC Blue concept at the Australian International Motor Show in Sydney. 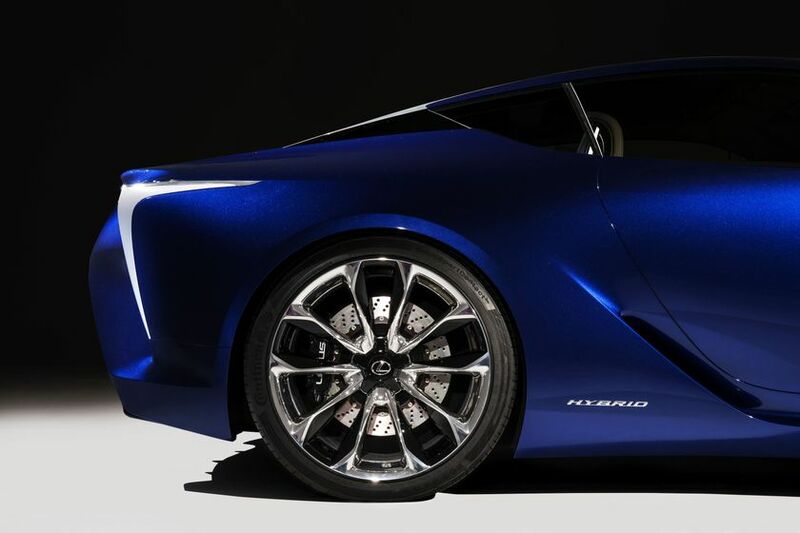 Clad in unique Opal Blue, it is the second version of the LF-LC, first debuted at the Detroit Auto Show earlier this year. Beneath the blue skin LF-LC combines advanced technologies and materials with organic design, giving an insight into what the future of sports cars may hold. Central to the concept is a suite of advanced materials and technologies, including lightweight carbon fibre and the next generation of Lexus’ industry-leading hybrid powertrain. 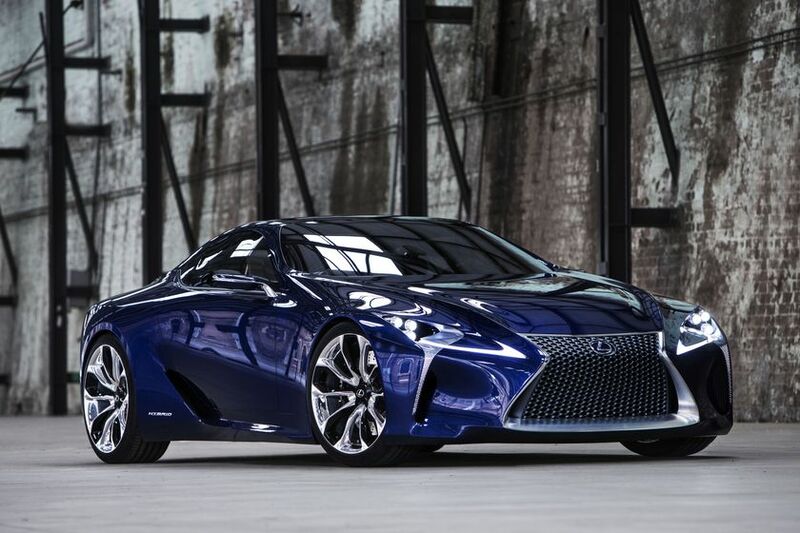 New to LF-LC and derived from project LFA, LF-LC leverages Lexus’ extensive in-house experience in marrying carbon fibre and aluminium alloy materials to achieve a light body mass. The result is an extremely taut body that responds quickly and crisply to driver inputs – providing the perfect platform for the next-generation Lexus Hybrid Drive system. Dubbed Advanced Lexus Hybrid Drive, the system features a powerful and efficient Atkinson cycle combustion engine which is mated to an advanced high-energy battery pack. The high-energy battery pack is designed to deliver greater power from a smaller battery than those currently used in Lexus’ range of hybrid vehicles. Combined, the LF-LC Blue concept's petrol/electric hybrid powertrain develops 372kW (500hp) – the most of any Lexus hybrid. Supporting LF-LC’s engineering feats is a stunning, technology-laden exterior and interior, clad in a new white and brown interior. Commanding the concept's bold front end are sculpted "L" shaped daytime running lights, vertical fog lamps and a fading dot matrix pattern to convey a sense of movement. Continuing the sense of motion, LF-LC's side profile is commanded by deeply sculpted air intakes behind the doors. A wrap-around glass roof provides a panoramic view to the outside world while slicing through the air. The concept car's glass roof features a lightweight, cantilevered pillar with a glass-to-glass junction inspired by modern architecture. LF-LC's dynamic lines are carried through to the rear deck, sculpturally integrating the spindle grille theme to complement the front of the vehicle while creating a unique sense of width. Tail lamps, inspired by a jet aeroplane afterburner, make use of inner lighting to create a remarkable sense of depth. The interior of the LF-LC concept contrasts the cool ambience of advanced technology with soft textures and organic shapes to create a driver-focused synergy of form and function. The cockpit expresses a feeling of both openness and security. The driver is enveloped by deeply scooped side panels and a high, curved console. The effect is to focus the driver zone on the controls and on the road. 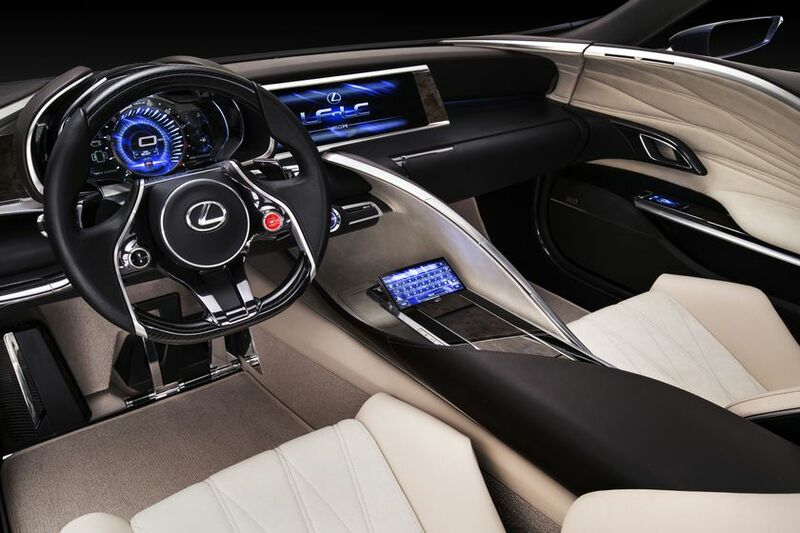 Based on Lexus' commitment to creating an intuitive driving experience, the LF-LC incorporates a remote touch-screen device that allows the driver to comfortably operate controls without shifting position or altering their line of sight. Twin 12.3-inch LCD screens provide information and navigation display. Inputs come from a touch-screen control board piercing the swept centre console. The interface is used to control the audio system, climate controls and navigation, and features a pop-up touch-screen keyboard for more complex entries. Set directly in front of the driver, multi-level meters layer analogue and LCD technologies. The bottom layer displays temperature, fuel and the background for the Eco meter. The middle layer is the tachometer mechanical centre ring. The topmost layer provides indicators for the tachometer, speedometer and Eco meter. Surfaces throughout the cabin are presented in a combination of smooth leather and suede, with brushed metal trim and wood accents. The lightweight, race-inspired front seats are formed of multiple layers and repeat the interlacing curves that define the cabin interior. The racing-style steering wheel is clad in lightweight carbon fibre and contains integrated controls and start button.